Setting priorities and managing time effectively is basic to enhancing individual and organizational performance. The pressure to find innovative ways to achieve goals, keep abreast of the competition, respond quickly to customer needs, and enjoy life outside of work is increasingly intense in today’s less structured, information-driven workplace. Meeting the daily challenges of managing professional and personal responsibilities requires a learning strategy designed to meet individual needs. If you could reduce your staff’s wasted time by just five minutes every hour, productivity would jump 8.3 percent! Efficiency levels would also rise as employees began to devote more time to critical tasks. Managing ourselves means learning new habits. To change your habits, you must first identify them. How do you spend your day? What takes up most of your time? Are you doing things that are important? By identifying these things, you can begin to maximize your time and understand what to let go. Integrating the Time Mastery Profile® into FranklinCovey® training programs provides a foundation for understanding your habits and identifying what is important. 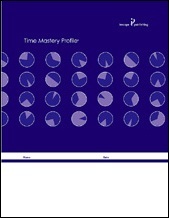 The Time Mastery Profile® is a unique tool that provides people with a complete, self-directed assessment of their current time management effectiveness. The instrument is comprised of 60 statements that describe employees’ time-related behavior in 12 categories. Attitudes – Committing to personal control. Goals – Focusing on objectives rather than activities. Priorities – Putting first things first by defining relative importance. Analyzing – Personal time patterns and opportunities for improvement. Planning – Six questions to ask when allocating time and work. Scheduling – Deciding when to do what you’ve planned. Interruptions – Minimizing and managing uncontrollable events. Meetings – Making meetings shorter and more productive. Paperwork – When and how to dump it, delegate it, do it, or delay it. Delegation – Horizontal and vertical sharing of work, authority, and accountability. Procrastination – Learning to stop postponing the inevitable. Time Teamwork – Mastering time in an era of teams and workgroups. The Time Mastery Profile includes a workbook that helps transform self-awareness into results. Practical tips help employees improve their time management skills in 12 key categories. Finally, the workbook supplies a detailed framework for a personal action plan under each of the 12 headings. It is written in plain, contemporary language for staff and line personnel at every level of your organization. It’s a comprehensive and friendly tool that enlightens without being condescending. The Time Mastery Profile is fast. Most people need less than an hour to take the first steps toward more effective management of their time. The Time Mastery Profile Facilitator’s Kit provides everything trainers need to administer the Time Mastery Profile in facilitated seminars. The kit includes research and technical background, a fully scripted seminar, presentation materials on CD-ROM, and two profiles. “DiSC”, “Everything DiSC”, and “Time Mastery Profile” are registered trademarks of John Wiley & Sons, Inc.